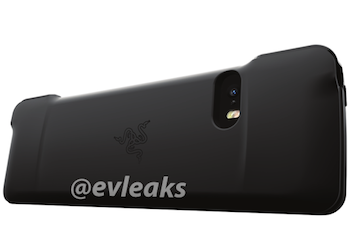 Razer may take a swing at making the iPhone into a controller. 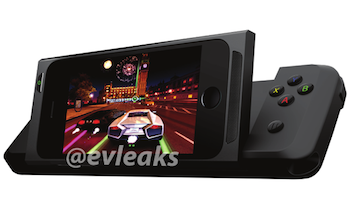 A series of images posted on Twitter today may be a first look at an iPhone snap-on gamepad peripheral from Razer. The images come courtesy of serial tech leaker @EVLeaks, an anonymous Twitter user with a proven track record posting early images of unannounced smartphones and tablets. On it's own, the so-called Razer Kazuyo basically looks like a smaller, sleeker version of the Wii U gamepad with the screen scooped out: The device features four backlit face buttons on one side and a d-pad on other, with gap in the middle where the iPhone snaps into its housing. Once the phone is snapped into place, a hinge allows users to tilt the phone up to a 45 degree angle. The Kazuyo has eight buttons in all - four face buttons, two shoulder buttons, a start/home button and a power button - and a d-pad for movement. It also appears to have a built-in speaker on the edge of the central housing where the phone snaps into place. Apple added a gamepad support API with iOS 7 in September, allowing third-parties to build new controller solutions for iPhone and iPad gaming. 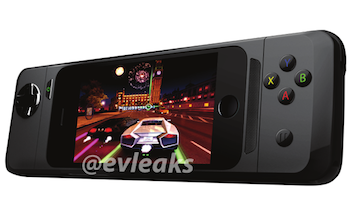 Power A and Logitech have both released similar-looking iPhone controllers in recent months.